When I first discovered the Melody Maker in March 2001 I thought it looked like an interesting idea so I bought one and tried it out. It took me a week or so to get used to after playing a traditional harmonica for over 30 years, but the first day I knew this was the perfect harp for me. I had no intention of adding a harmonica section to this website but quite a few people have asked me what type of harp I’m playing on different songs since they’re unable to play along in either straight harp or cross harp. I’ve seen a few comments on the Internet about the Melody Maker being an “advanced tool for advanced players.” It is that for sure, but it’s also perfect for beginners. Not only does it completely replace the need to learn straight harp, but it makes it unbelievably easy to learn cross harp as well. Since there is almost no instruction for the Melody Maker, I decided to do this section with only tabs featuring the Melody Maker. There are already many other websites where you can learn proper playing techniques and I won’t go into that. All of the tabs in this section are in the key of G and if you want to play along you need a Melody Maker in the key of G. Lee Oskar harmonicas are carried by many music stores and there’s a good possibility you can buy one locally. You can also buy one at a discount on Amazon.com. Among modern harmonica players there are two main styles of playing. These are called “straight harp” and “cross harp.” The most commonly played harmonica over the years has been the 10-hole Major Diatonic. Playing straight harp in the key of C on a Major Diatonic you would use a C harmonica. Straight harp is easier to learn but has some pretty major limitations since the only full octave containing an entire major scale is in the upper register and most of the important melody notes, including the tonic, is a blow note, which is much harder to bend than a draw note. Somewhere along the line it was discovered that if you played a a standard C harmonica along with music that was in the key of G you could get certain notes and effects that weren’t available playing straight harp. This became known as cross harp and is played now by the great majority of accomplished harmonica players. Although cross harp was adopted by most harmonica players, it still has its own set of problems, most notably the lack of a couple notes that will allow you to play complete melodies on most songs. This doesn’t present as much of a problem to someone who plays blues exclusively, but for those of us who want to play complete melodies of songs it’s a definite drawback. 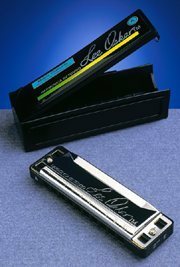 Lee Oskar, one of the world’s foremost experts on harmonicas, developed the Melody Maker harmonica to address these problems. Now all of the notes that were missing from the Major Diatonic harmonica are available on the Melody Maker! This harmonica allows you to play a complete major scale in cross harp so you can play melodies without the need to bend notes, but you can still bend the draw notes to achieve a bluesy feeling. Another benefit of the Melody Maker is that only 3 notes have been altered from standard cross harp playing, so it’s very easy to learn to play the Melody Maker then switch to a regular Major Diatonic for normal cross harp playing. It has been a common practice over the years for people to learn straight harp, then when they’ve advanced enough they graduate to cross harp. The problem with that is that all of the notes are rearranged, which makes it a difficult transition. With the Melody Maker this is simplified tremendously. Major Diatonics offer a complete major scale in straight harp. Melody Makers provide a complete major scale in cross harp. The Melody Maker in the key of G is almost identical to the Major Diatonic in the key of C, with the exception of the 3 highlighted notes above. C Major Diatonic play in G... in cross harp. Major Diatonics are key-labeled in straight harp. However, when played in cross harp, the key of the harp is not the same as the key of music. G Melody Maker plays in G... in cross harp. Melody Makers are key-labeled in cross harp. This makes it easy to know which key of Melody Maker to use. To play music in the key of G, in cross harp, use a G Melody Maker. It’s that simple! G for G.